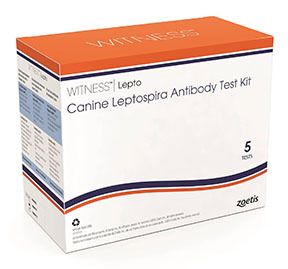 Zoetis’ new Witness Lepto is a rapid, point-of-care diagnostic test available in the U.S. that detects the primary immune response to canine leptospires as early as four days after infection, according to the company. The test specifically detects anti-Lepstospira immunoglobulin M (IgM) antibodies to four of the most common serovars—canicola, grippotyphosa, icterohaemorrhagiae and pomona—affecting dogs. Witness Lepto requires 5 microliters of sample of anticoagulated whole blood, serum or plasma for each test and approximately 10 minutes to produce results. Instead of waiting for leptospirosis test results from a laboratory, veterinarians can now test suspect dogs with Witness Lepto in the clinic and, based on the in-clinic result, confidently begin appropriate treatment, the company stated, adding that laboratory confirmation can be performed as needed. Witness Lepto will be available April 20. For more information, visit http://zoetisus.com/lepto.